The fact of the matter is, having a minimalist style is going to look different for everyone. That means you get to choose. You are in full control. If you like neutral colors, keep them. Maybe you like wearing bright, flashy, neon attire. In that case…that’s what you should wear. So why have neutral colors been tied to minimalism? Quite simply because they stand the test of time. Just like the little black dress will never go out of style, neither will white, grey or simple earth tones. With neutrals there is no “hot color” of the season. That means your wardrobe may never go out of style. As a recovering shopaholic, believe me when I say this doesn’t mean you’re stuck in boring clothes all the time. Oh no. I still love my wardrobe and don’t feel bored at all. When you dress like a minimalist it doesn’t mean you get less options it means the only options you have are the absolute best. The first step I recommend when starting to dress like a minimalist is to KonMari your wardrobe. If you haven’t heard of the KonMari method, checkout some of my posts below or watch our KonMari method closet declutter video. Going through your clothes and keeping only the ones that bring you the most joy help ensure that you are only wearing clothes that make you happy each day. Decluttering your wardrobe helps you dress like a minimalist every day and makes choosing what to wear so much easier. I still remember back in high school I would try on 13 different items, leave them scattered across my floor and still not really like what I was wearing. With the KonMari method you are guaranteed to always love what you have on because you are only keeping the best of the best. Take it from a recovering shopaholic, this is no way to look good or save money. I used to get so excited by a sale or a clearance section that instead of only buying things I truly loved, I was just hunting for a good price tag. In the same respect, you could quickly find an over-priced item that in the heat of the moment you feel like you have to have only to leave the store with buyer’s remorse. Tom does this to an extreme. He will think about an item, purchase the item, and then keep it in the bag with the tags on for a month. This is a little too far for my taste, but you’d better believe he only hangs onto the things that he absolutely finds value in. Just because you shouldn’t base your shopping method off what is on sale that day, doesn’t mean you don’t deserve to save some money where you can. Before I head to my favorite stores, I will always check my Ibotta app to see if the store I am shopping at gives a percentage back on purchases. Ibotta often works with my favorite stores like American Eagle and Under Armor to give me around 5% cash back on anything I buy. Get $10 in cash with Ibotta when you sign up. When it comes to online shopping, I usually start at Ebates. You can go to the Ebates website and login to your account, (get $10 for signing up) and see what stores are offering rebates that day. You can earn cash back on stores, hotels and even vacations. To keep myself extra covered when shopping online I installed the Honey app into my tool bar. Whenever I am about to purchase something online, Honey will scour the internet checking for coupon codes and discounts that can be applied to help me save even more money. Get Honey. Last but not least, I have the Dosh rebate app synced with my debit and credit cards. With Dosh, I don’t have to search for rebates or scan coupons. If I make a qualifying purchase with one of my accounts, Dosh instantly gives me rebate money. Get $5 when you link your first card. No. Just no. If you try on an item and you aren’t instantly in love with the feel, color and how it fits you, then do not bring it home with you. Dressing like a minimalist is all about keeping things simple and only putting on your body that which makes you instantly feel joyful. Who cares what you should be liking these days. Ignore the ever changing fads and only focus on what you like. You know what? I like super flared jeans and a few years ago I finally got rid of them because skinny jeans were clearly sticking around. Well, you know what? Low rise jeans and flare is coming back and now I’ll have to re-purchase everything. Fads are ever changing but something that brings you joy can last forever. I’m not saying it will, but it might. My method of shopping back in my shopaholic days was finding the best bargains around. This left me with a closet full of clothes I kind-of liked that were poorly made…and an empty wallet. Instead, save your money, make smart purchases and buy only items that are of the best quality and are sure to stand the test of time. That might mean you are buying one pair of $50 jeans instead of 10 shirts at $5 a piece. 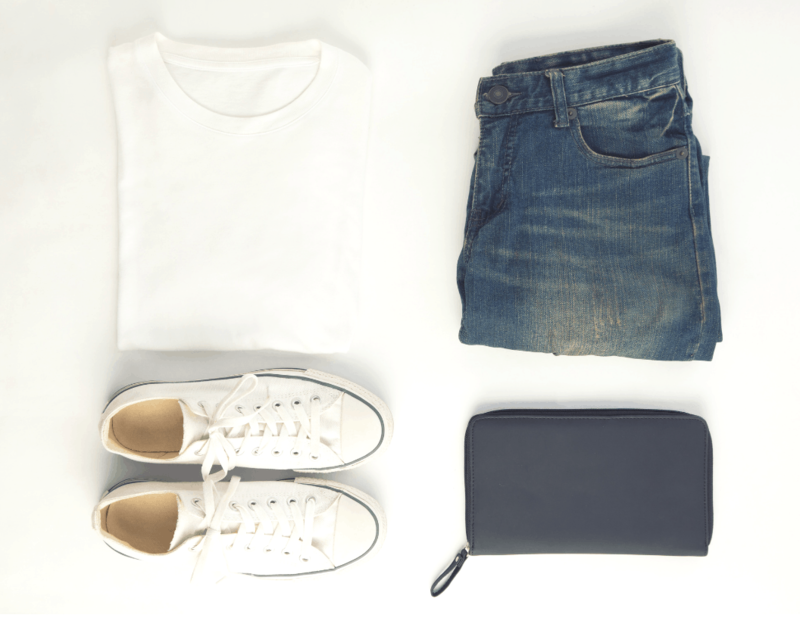 Dressing like a minimalist is all about finding quality in the things you own. So don’t be afraid to own the best. Don’t think that just because you decluttered your closet once that you are officially in the clear. Oh no. It’s so important to keep re-evaluating the things that you own. What once brought you joy, may no longer serve you and that’s ok.
Lastly, make sure you are sticking to a budget whenever you are shopping for new clothes. My Fun Sized Budget Bundle is a great place to get started with simple budgeting methods. You could set aside something as small as $25 per month into a clothing fund so when you are ready to make a new purchase, you already have some money set aside. Sticking with a budget in every area of your life is a helpful way to have more money in your pocket and more control of your entire life.